Q: How to tell human hair with synthetic hair ? A:Yes! Golden Perfect offers 100% human hair without any mixing. The hair can be colored if you take the original 1b/natural#. As a general rule it is easier to darken the hair than to lighten the hair. But blonde hair has been bleached more so more caution must be taken when working with blonde hair. Always use a good quality hair dye and test a small strand first. It is best to always turn to your stylist instead of handle by yourself. Just like our own hair, the less heat you use the better. Q: Why is my hair get tangled or shedding ? A:Our Perfect Extension are 100% human hair, it tangles because of mishandling comb, dryness,oil&dirt build-up,salt water. Please wash & condition your hair once a week,twice a week at least. The first time you wash it,it may have a little shedding it's normal. Brush with a big comb upwards,wet them before you brush them. Heat damages from blow-dryers,curling irons,and flatirons as well as coloring. Q: How long do hair extensions usually last? A:Our Perfect Extension are 100% human hair, so they last as long as you want them to. If you look after your hair it is not uncommon for quality hair to last up to 12 months. If not treated with care they will need to be replaced every three to six months. The more you protect them the longer they will last. 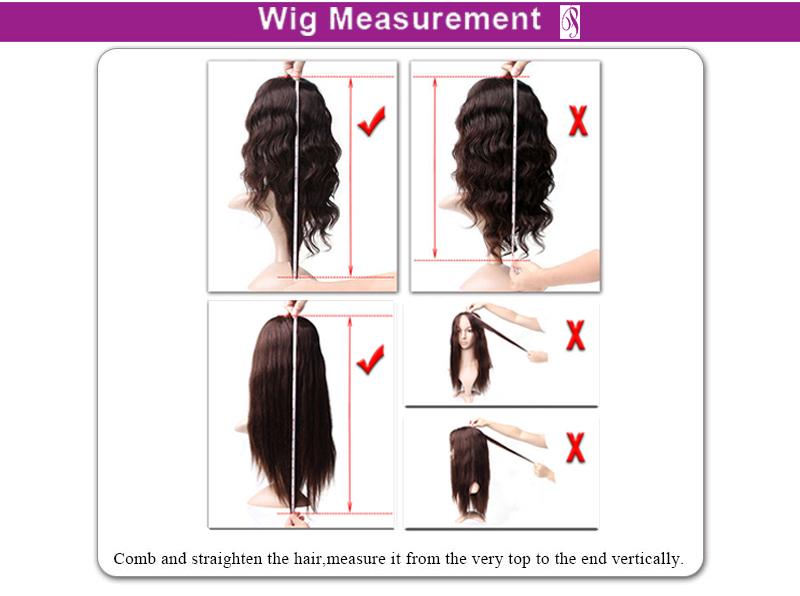 Q: How to measure the hair & wig length?